Here you can find a "gentleman's set" of premium and elite software for your Nokia phone with Delight Belle OS. General note: there is no guarantee that every listed here component will work 100%. ABBYY BCR 2.0 is a handy application for Nokia smartphones which allows users to quickly and easily capture contact information from business cards and add it to the mobile address book together with a photo of a given contact person. BCR helps save time and effort by eliminated the need to manually type in names, phones and other key info. It promises to be of great use and value to business persons and anyone who communicates a lot. ABBYY FotoTranslate is an innovative solution for travel and business trips. Translate words with a single button push, wherever you are - you don't need to type unknown foreign words by hand. 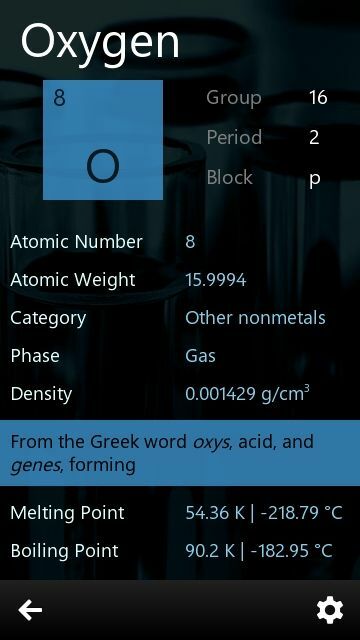 The program automatically recognises the words taken on the camera of your smartphone and shows the translation. Snap a foreign word - get an instant translation! ABBYY Lingvo x3 Mobile is a dictionary, which allows you to translate words and word combinations quickly and accurately in a moment. This dictionary includes excellent coverage of new expressions and phrases including phonetic script. ABBYY Lingvo x3 is an ideal companion for work, travel or study, wherever you are. 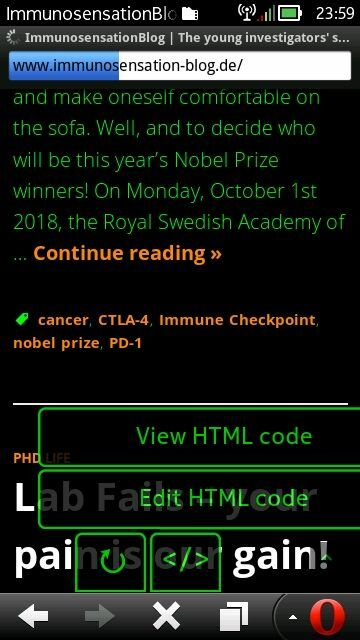 Adobe Reader is the best PDF (Adobe Portable Document Format) viewer optimised for Nokia devices. Enjoy enhanced PDF viewing of documents (files and attachments) using reflow view, zoom view, page rotation, text search and many others best features. Supports English, French, Italian, German, Spanish, and more. View PDF files on the go with highest fidelity solution anytime, anywhere! Note: just install it and skip registration (as the service is down, registration is useless). • Displays time and date. • Displays missed calls and new SMS. • Preserves screen orientation (optional). • Clock moves slowly from top to bottom within a day. • Turns the display off while phone is in a pocket to save power. After installation go to Settings -> Themes -> Screen saver and select "Anna screensaver+"! Don't use an app, but unable to remove it and its icon bothers you? AppsHider allows hiding apps icons without removing them. Clear your phone menu from unwanted icons! Note: you can hide no more than 25 icons! • Uncompressed recording with up to 96 kHz in stereo! • Optimised for Nokia 808 PureView, but works well on other devices too! • Codecs: uncompressed PCM audio, AAC, AMR. 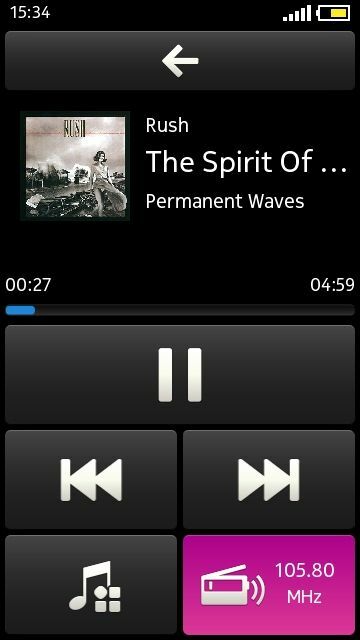 • Formats: WAV, 3GP, MP4. 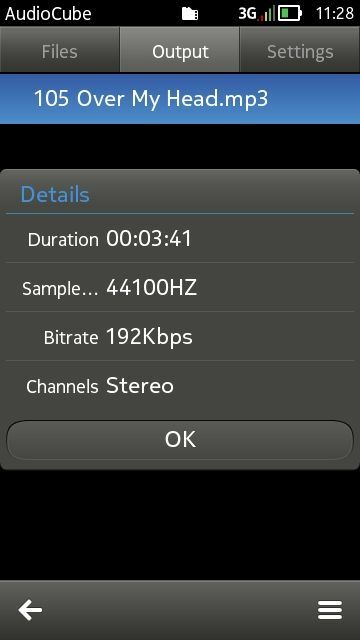 • Settings for mono, stereo, bit rates, storage location, input: microphone, voice, FM-radio (FP1 only), etc. 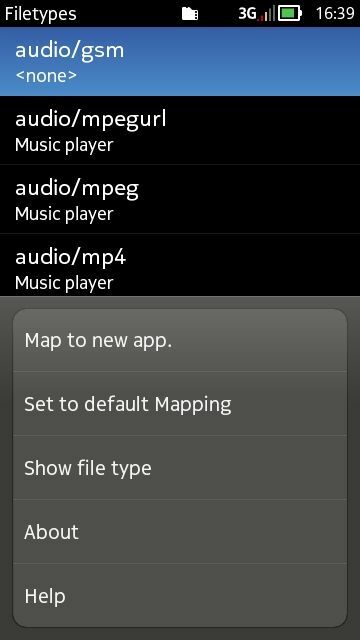 AudioCube is a powerful audio process tool for Nokia smartphone. It has two main features, one is quick extraction, and the other is conversion. It supports many audio file formats, such as WAV, AAC, AMR, MP3, WMA, AIFF, etc. You can use AudioCube to convert your music or ringtone to other format, and share them with your friends who may have a phone but do not support yours. Whole MP3 song conversion can work fine, but not suggested, as it is very time consuming because of the smartphone limited processing ability. It's very funny that you can use AudioCube to make your private phone ringtones. It is very simple. 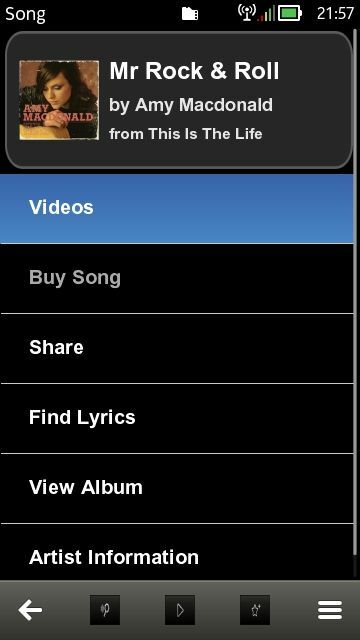 Just use AudioCube to extract a section of music from your favourite song, save it, and then set it as your phone ringtone. If you are not familiar with audio conversion, and have no knowledge about sample rate, bit rate, channels, etc., you can also do your audio conversion well by using the default converter, which provides default settings for each audio codec. Backgammon has been played throughout the world for thousands of years. ZingMagic's critically acclaimed version of Backgammon enables you to play this most popular of board games to a high standard anytime, anywhere. Features include: play against the computer or another human player, multiple levels of computer play and a high quality artificial intelligence engine particularly at expert level. BigBen is a clock utility with many extras, that even allows the phone to look and sound like the famous tower clock in London. In locked state BigBen protects the phone from accidental use, and also acts as a screensaver, with fully customisable clock faces, backgrounds, and colours. The application offers hourly chimes, moreover visible and audible reminders for events like missed calls, alarms and messages. Two mobiles. One game. Play ball. Challenge your friend in a fast-paced duel. Bounce a ball back and forth between two devices by drawing collision lines into the game area and score points by delivering the ball into your opponent's goal. Download now and have a ball! Simply tap compatible NFC device to make Bluetooth connection and start playing. • Up to 30 pictures / second (equals 1800 pictures / minute!). 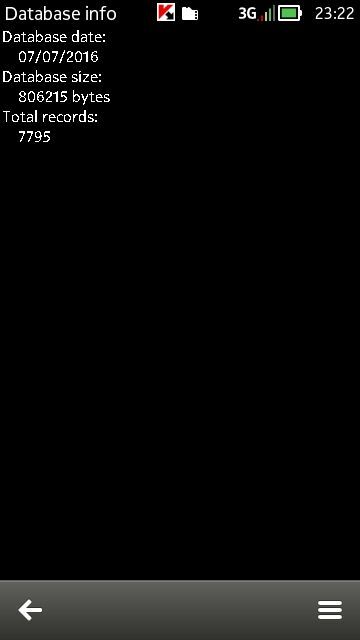 • Flash support (only Nokia 808 PureView). • 4x lossless zoom (only Nokia 808 PureView, up to 11 digital zoom). CameraFX creates funny effects from images and live camera preview and shots. Effects include Gaussian blur, edge filters, mirroring, emboss, water, swirl, lomo, custom filters, and much more. CameraFX is the ideal supplement to CameraPro. CameraPro Qt 3 is powerful camera / video app: 11x digital zoom, raw JPEG stream, level meter, anti-shake, time lapse, bracketing (HDR), continuous autofocus / macro (device dependent), ISO, presets, timer, burst, face-detection, 720p video (1-30 FPS), custom frame rates / bitrates, and former Facebook / Flickr / Twitter / Picasa / SmugMug uploader. Nokia 808's version provides 1080p video and PureView support. Steeped in history, Checkers has been a favourite board game for centuries. With support for over 10 different variations of Checkers including American, International, Italian and Russian Checkers and over 20 levels of play, Checkers Pro V is your ultimate Checkers companion. ZingMagic's multi award winning Chess application is renowned for its superb playability for players of all levels from beginner to expert. Features include: over 20 levels of play; stunning graphics with choice of boards and piece sets; hints and tips to improve your play. • Quick calculation of any complex expression. 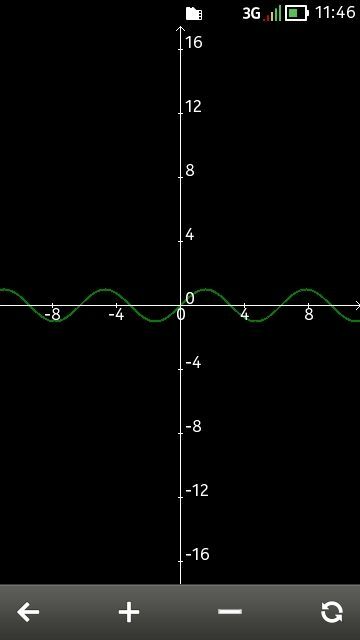 • Plots any 2D graphs. • 50+ built-in functions separated in 5 categories. • Sum (∑) and product (∏) functions. • DEG / RAD / GRAD units of angle measurement. 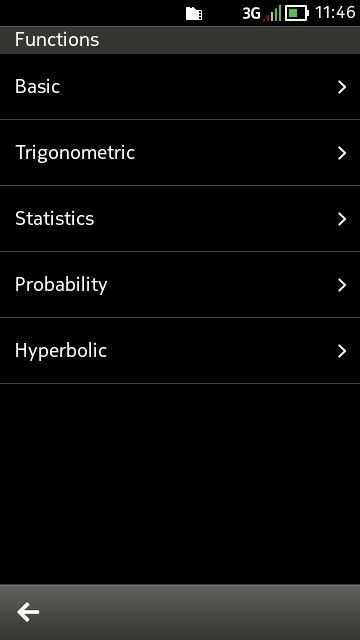 • All trigonometric and hyperbolic functions. • Logarithmic and exponential functions. • Daily and hourly forecast. 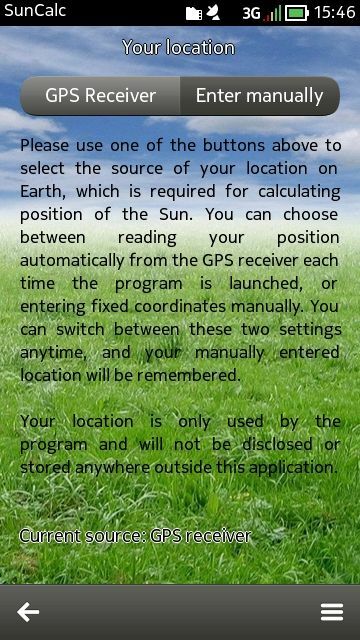 • Manual location input or its automatic determination via GPS. • Shows battery percentage and has dark or light theme option. • Settings for default units of measurement. Get weather conditions and forecast for almost any location! See what happens when storytelling meets the newest technology with the new CNN App for Nokia smartphones - a smarter, sleeker way to experience a world of news and insights. Immerse yourself in the latest top stories, business, world sports, entertainment, technology and more. Watch live breaking news video, share news and insights, and submit your own story to the world with iReport. Add some creativity to your photos! Make them black and white, and just bring the colour back for some important fragments. Highlight what is important to you! Colourful people in the grey landscape, or maybe little vivid, colourful flower in the vast grey forest? Surprise yourself! Important: reboot the device after a successful installation of this application. 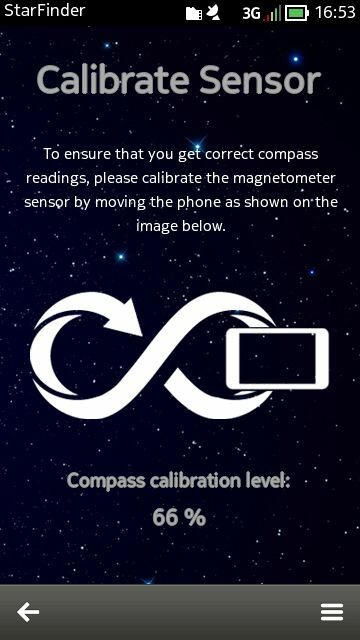 Compass is a Forum Nokia example application that teaches the use of a traditional compass and allows the user to determine the bearing to the desired location using Ovi maps. The main purpose of the example application is to demonstrate the use of the Maps and Navigation API. 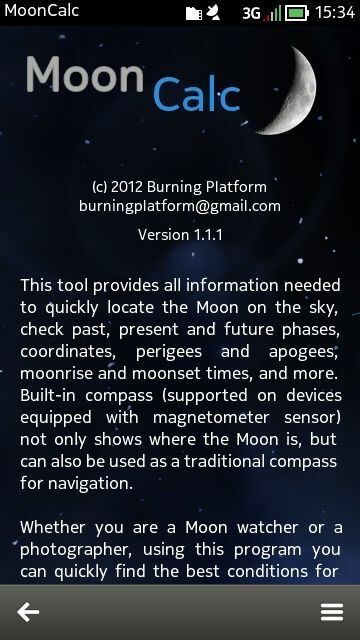 The application has two modes: Compass mode and Map mode. 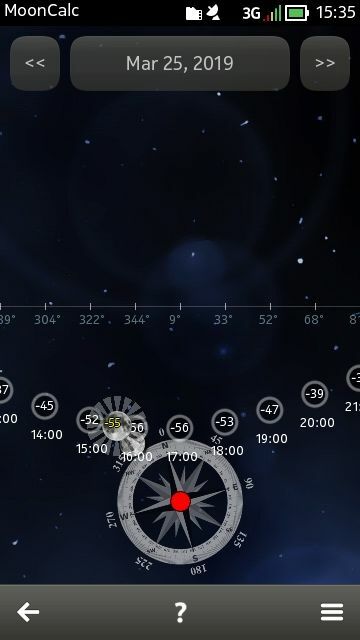 In the Map mode, which does not work currently, you could have viewed the map with your current position retrieved by GPS and indicated with a red circle. Manage your everyday expenses, such as expenses for dining, shopping or entertainment. Categories are fully customiseable, and include support for mileage and multi-item bills. For each log unlimited number of photos (e.g. receipts) can be stored and logs can be exported into an Excel friendly format and emailed. Further DailyXpenses includes a currency converter. 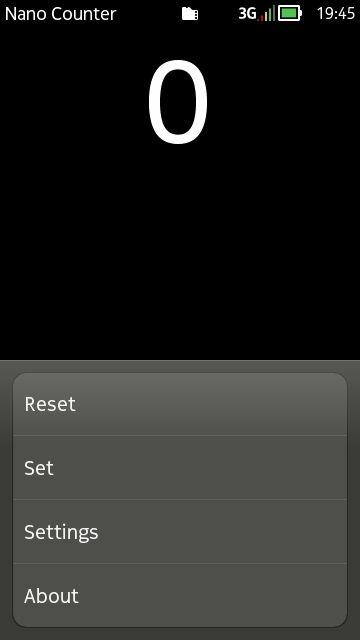 EasyStopWatch is an easy-to-use stopwatch application. Features include lap support, device backlight never dims while on the application, full landscape support, ask to exit so you never accidentally close the app, countdown and large stopwatch mode. Exif Viewer shows all EXIF tags stored in your pictures, for instance camera type, exposure time, aperture, F-Number, ISO, GPS position, and many more (only tags which are stored in your photo are shown). 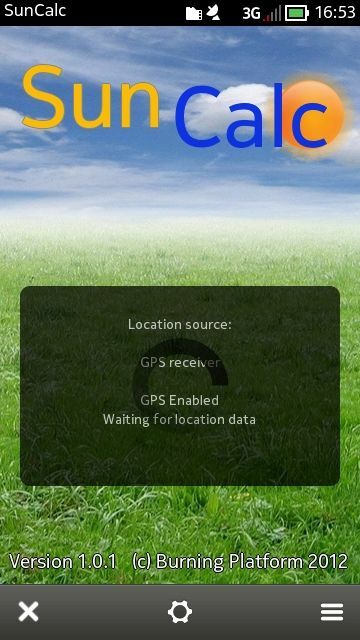 If the picture contains GPS information, then the location can be optionally removed. • Full HD support (Nokia 808 only). • Trigger with headset buttons. • Various effects, e.g. lighten, add, darken, average (to reduce noise), etc. • Flash support (only LED flash). • Selection of pictures to be included. • Zoom and autofocus support. FastMotion lets you take time-lapse (stop motion, fast motion) videos with your phone's camera. Exposure, focus, white balance, zoom, and flash can be set during runtime. Frames are stored individually (JPG, PNG, BMP) and as a time-lapse movie (MP4) with up to Full HD format and fully customisable framerate and resolution. FBReader is an e-book reader, which supports a lot of book formats, including EPUB, FB2 (ZIP), MOBI, CHM, HTML, and plain text. FBReader is fast, highly customisable, and includes hyphenation patterns for 16 languages. Integration with several popular network libraries is also included; user can add own OPDS catalogues. Alternatevly you can download books manually and put them into Books catalogue on the memory card. FreeHashTab is a small hash tool. It supports MD5, SHA-1 and CRC32. If this program crashes while processing a huge file, disable CRC32 signature check. • Support for screenshots and screen recording. 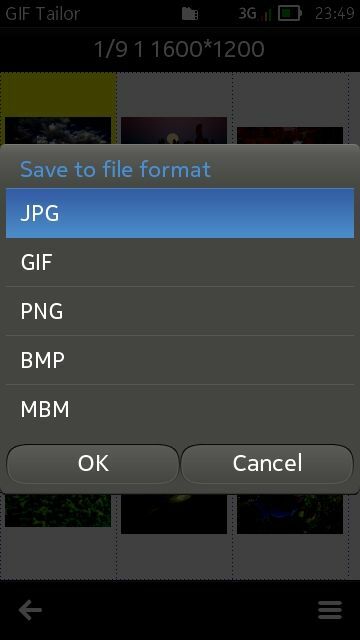 • Import and save a picture to JPG / GIF / PNG / BMP / MBM file (you can achieve image format conversion). • Animation speed can be either unified, or every single frame can be adjusted. • Supports watermark, from transparent colour to pure white (255, 255, 255). • Support for touch screen, you can drag images to the designated location. • Adjustable image output quality. • GIF picture can be split. GoPro Browser allows you to browse and download videos and photos over Wi-Fi directly from a GoPro Hero 2 (with Wi-Fi BacPac) and Hero 3 white / silver / black edition camera on your mobile device. If you like rock music and have the sense of rhythm, your road to stardom starts here! Guitarist or drummer, choose your path: travel from Berlin to Tokyo and fire up the most famous concert stages with your band. Touch the screen to the beat of your favourite songs and don't miss a note or you'll hear it! I Love Rock 'N Roll, Call Me, Paranoid, and more: play the most famous rock hits. Rock music needs its new legend: take up the challenge. HDR Pro Camera creates well-exposed images captured with the camera or from pictures in the photo gallery. Different parameters can be controlled, for instance saturation, brightness, contrast, picture alignment and others. With HWKey you can start any program with your hardware camera button. 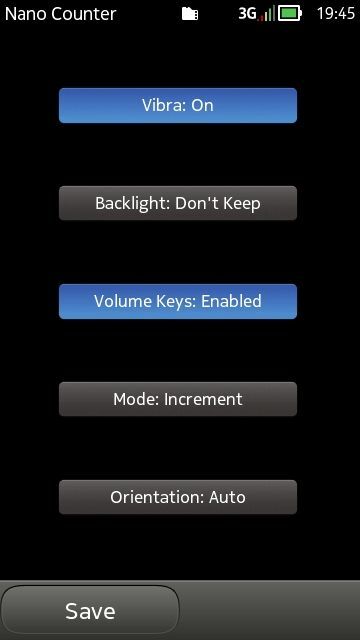 HWKey can be optionally auto-started when you turn on your phone. This program demonstrates some image encoder and decoder classes of the Image Conversion Library APIs available on the Nokia platform. An image can be opened either from the device memory or a memory card (if present). Once opened, the image can be rotated, scaled, and saved in the same or a different format (for example, a JPG image can be converted into a GIF, PNG, BMP or MBM image). The UI of the updated application has been optimised for touch-screen, thus fully supporting both devices with touch UI and ones with a traditional keypad. Infrared Photo Editor offers easy-to-use channel mixing (RGB, HSL) and contrast / brightness functions for image manipulation. With these simple controls you are able to create special effects such as changing the image mood (warm, cold, etc. ), old film, color mixing, and much more. Full resolution images are supported. Instant Menu offers a novel method to navigate the phone. The top-left corner of the screen becomes a special touch area. 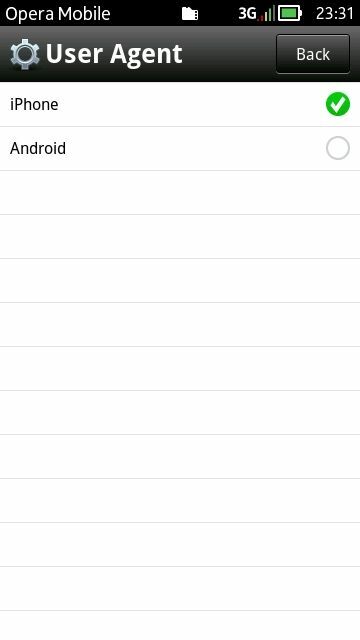 Upon a screen tap a customisable menu appears, listing shortcuts to applications and to various useful functions. Instant Menu can be invoked in any state, providing convenient access to all your phone's features, at the place where you need it most - that is, everywhere! 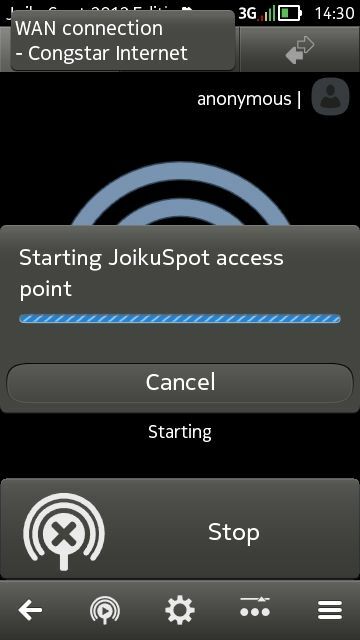 JoikuSpot 2012 Edition gets you JoikuSpot Premium functionality enriched with set of new features and value added services. That is, you can turn your phone to a secure Wi-Fi HotSpot, and set data caps and user limits to your HotSpot. 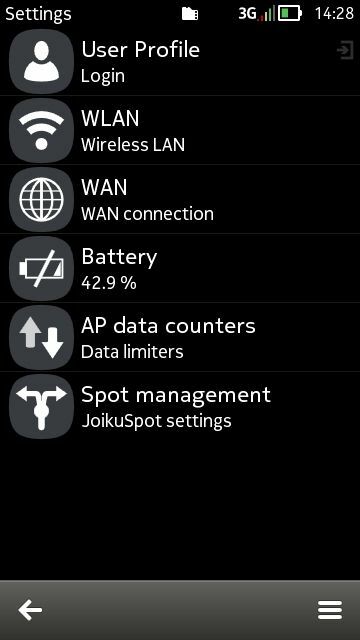 For Belle users: remember to turn Wi-Fi ON on your phone when using JoikuSpot, as by default it is OFF! Kaspersky Mobile Security 9 keeps your mobile life protected. • Anti-Theft - locate your phone if it is lost or stolen, remotely block or wipe your device. • Privacy Protection - hide and unhide private contacts, SMSs and call logs at the touch of a button. • Data Encryption - secure your most sensitive files and folders. • Anti-Spam - block annoying and unwanted calls and SMSs. • Anti-Virus and Firewall – malware and mobile fraud prevention. 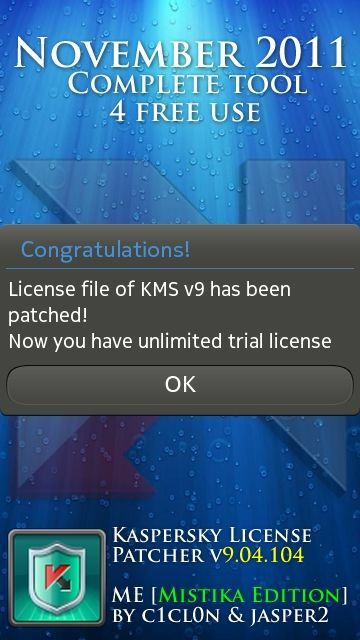 This is a fan assembly of KMS 9, which was discontinued for Nokia platform on 7 July 2016, meaning that it should not be possible to buy an official license for it afterwards. Thanks to the fans, who found a vulnerability in the program, we can use this product for lifetime! From now on, you must use KPatcher to activate it. Despite its notorious title, KPatcher has nothing common with patches! 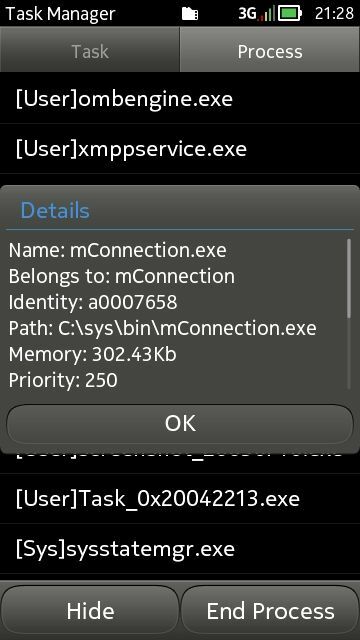 It just copies a config file, which is being generated by Kaspersky Mobile Security itself from the first launch (unique for every single device), to a different location, thus making KMS actually activated. As a matter of fact, there is no warez behind this release! KeepItOn keeps the display backlight active as long as it is running (useful while surfing, navigation, messaging, etc.). 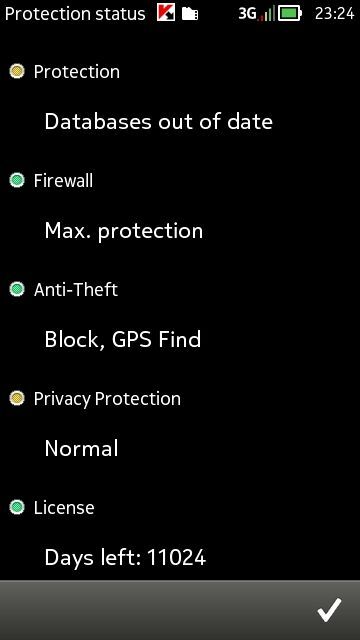 KeepItOn can run in background, display light can be on for infinite time, or for a predefined time period, and screen brightness can be controlled. 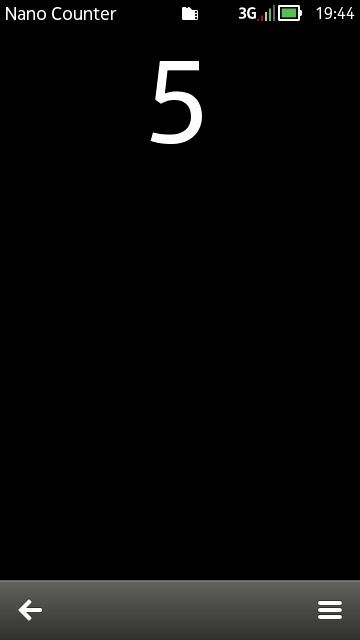 Energy saving options can be setup so that light is only active when the phone is connected to a charger or if battery level is above a certain rate. A simple shortcut to lock your phone. 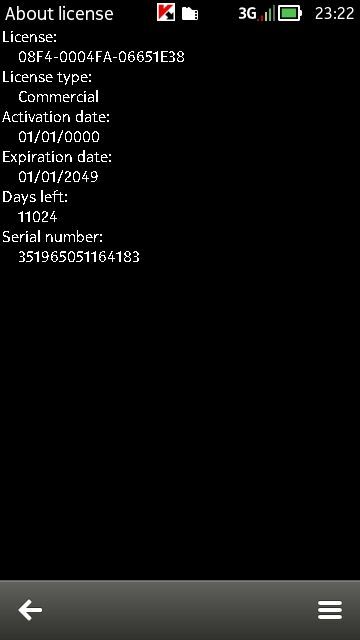 This app can extend the life of your lock key and works always. 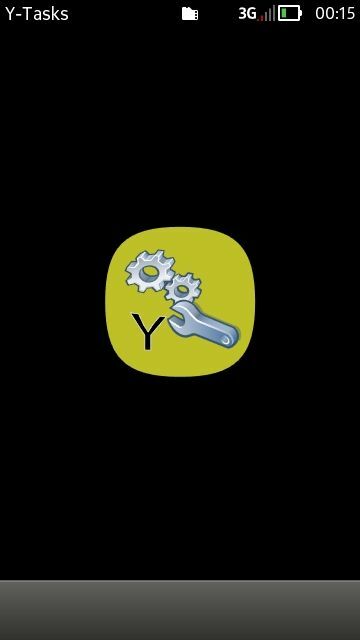 Hardware key and other lock apps don't work directly after a reboot, this app fixed it. Thanks ApexDesigns Inc. for the icon. A tool for creating standard IMAP mailboxes. Creates an empty mailbox with Google mail settings. You can then edit the settings from the mail application. You cannot create the mailbox with usual email wizard any more, as it will use the Nokia proxy service which is down. How often did you have a low account with a thought in your mind "Ha, with two minutes Internet browsing my account would not get empty". And how often did you have to switch on a preinstalled connection manager to check the amount of megabytes used? How often did you meter a speed of your connection? Think about it - it is uncomfortable, isn't it? That's why mConnection shows the amount of used traffic and current speed of your connection. This program can work with any Access Point of your device. Information is shown in a pop-up window on top of the other windows. This is a modified touch version of "mConnection v0.05b" by Jazzfusion. The purpose of the modification is adaptation of XY settings with regard to a larger screen size. Now you can set the value of monitor position to more than 415 pixels (up to 999 pixels). Scan documents, business cards, or presentation billboards in a snap of your camera phone! MDScan (Mobile Document Sacanner) is not just another mobile multi-page document scanner. With unique automatic processing functions documents produced by MDScan are always clean and legible, are easy on the eyes and take minimum storage space. You can share your scans as JPEG or PDF docs. This is the most powerful and hard-core task manager that you have ever seen, because it is made by Nokia Corporation to help developers! There are too many functions - e.g., here you can see detailed information about your device, or any process, thread and service; you can also close and kill processes... One of the most interesting functions in MemSpy could be viewing all files open by the system at any time. Microsoft Apps is a suite of productivity applications. If you do not have a valid license to Microsoft Lync 2010 server, Lync Online or Microsoft SharePoint server, you may not use Microsoft Lync or connect to Microsoft SharePoint sites. These apps require big amount of space from C drive. Device reboot is needed. Mobile Speak is a powerful screen reader available for people with visual impairments and also for general users who would like additional voice assistance on their smartphone. Information displayed on the screen is spoken via the speaker or headset using the phone's built-in TTS voices (no third-party TTS can be used with this version). Mobile Speak supports Nokia Maps, Braille and (on supported devices) screen magnification. 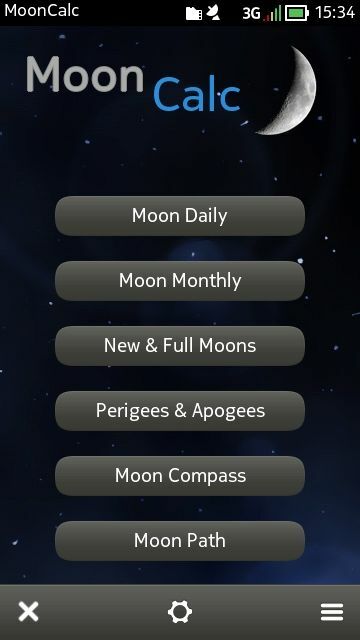 Advanced moon tool providing rich real-time calculations of moon phases, age, illumination, distance, apparent size, coordinates (right ascension, declination, ecliptic latitude and longitude), azimuth, elevation, moonrise and moonset times, perigees and apogees, new and full moons, moon compass and more. 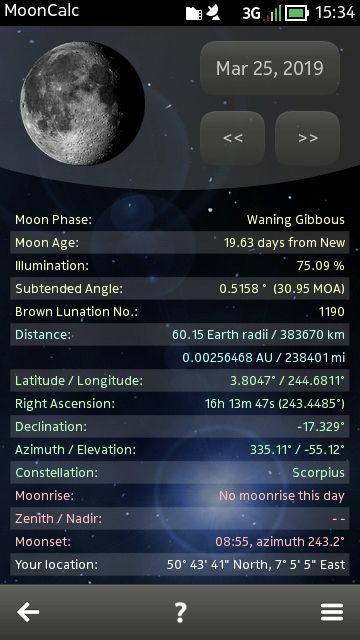 Shows interactive graph of moon path through the sky for any date and location. Supports both GPS and manually entered locations. • Wi-Fi file transfer. You can open, copy or move files between the phone and a PC (Windows, Mac OS or Linux). There is no need to install any software on the computer. • Password-protected folder for private information. • Advanced text viewer with custom encoding (including Cyrillic), font size and colour, and smart reflow. • Open, view and extract files from ZIP, RAR, 7Z, TAR, GZ and BZ2 archives. 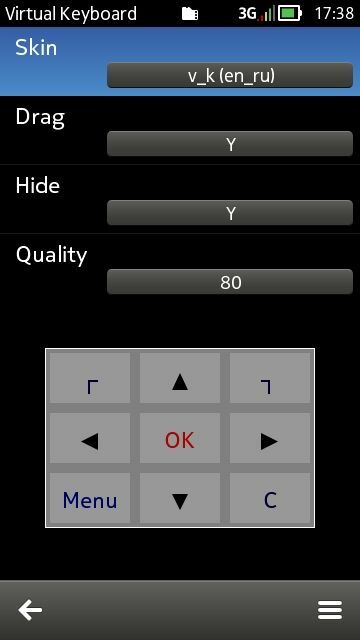 • Counting by tapping on the screen and / or pressing volume keys. • Always keeps backlight on if you need. 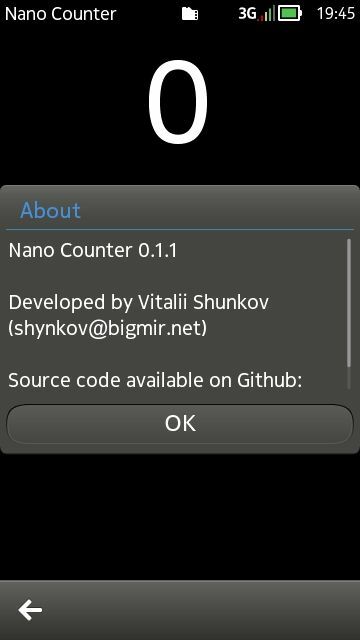 • Saves all settings including latest counter value when you close the application. • Two modes: increment and decrement. • Portrait, landscape or auto orientation. This is a time synchroniser that compares the time of your device with one of the 5 selectable servers. They are Brazilian and Belgian servers of tier 2 (Stratum 2) as well as Russian, American and Japanese servers of tier 1 (Stratum 1). Tier 1 servers are the most accurate: the exact time is taken from either the atomic clock reference (Japanese) or from a GPS source (Russian and American). For ethical reasons, please do not use tier 1 servers for auto-synchronisation of mobile and desktop devices in order to avoid overload of the former! For normal auto-synchronisation, it's enough to use tier 2 servers. Nimbuzz Messenger is a free chat and calling app. Nimbuzz lets you make friends in chat rooms, start group chats, share photos on any mobile device across popular IM. Nokia Car Mode reduces driver distraction through the inclusion of applications that have been designed for in-car use, like making calls, navigating, and listening to music. 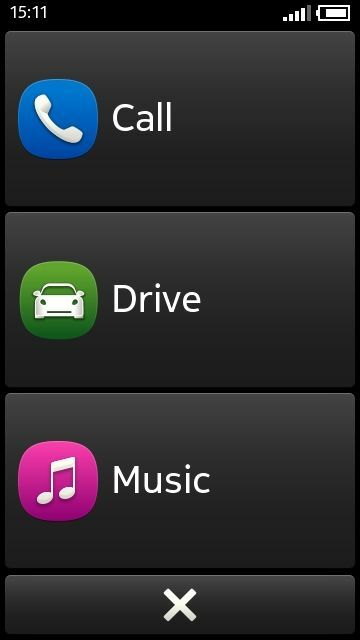 Enter your car, plug the phone into a MirrorLink compatible USB infotainment, and enjoy these apps on the in-car display. 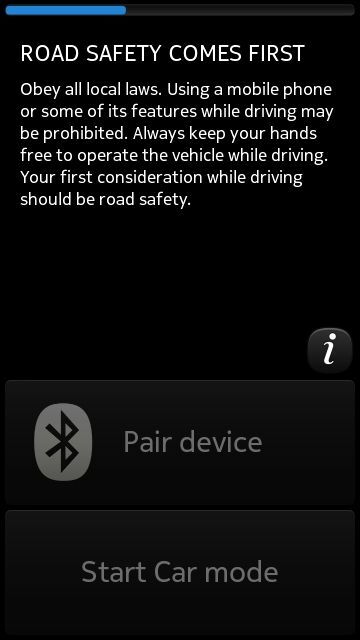 Note: Car Mode requires a MirrorLink certified car infotainment, and Maps SR8 or newer. The Nokia Energy Profiler is an application that enables developers and device users to examine power consumption and several other parameters on Nokia devices. The reporting provided by the Nokia Energy Profiler enables developers to identify and improve application functions that consume excessive amounts of power and thus to create higher-quality applications. Users can check which applications don't power efficient and limit the standby time of their devices. 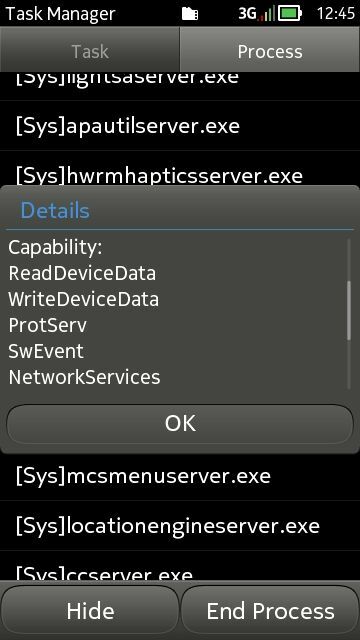 PerfMon is an application for our Nokia, with which we can monitor the performance of our device through various parameters. These parameters are: CPU, RAM, physical memory (C, D, E, F, G, H, I), GPU RAM, power, SWAP file. We can also see real-time monitoring in graphical mode, selecting the parameters needed to be observed. For this purpose, you must go to Options -> Settings, and select "Sources" in the "Graphs" tab. Place virtual sticky notes everywhere on your phone screen. Sticky notes can be placed as overlays on arbitrary applications. Additional features: autostart, different colours and line sizes. • Saves last opened document and its position. • Landscape and portrait orientations. • Kinetic scroll and UI animation. • Can be used as default reader. • Reads Chinese and Japanese documents and more. 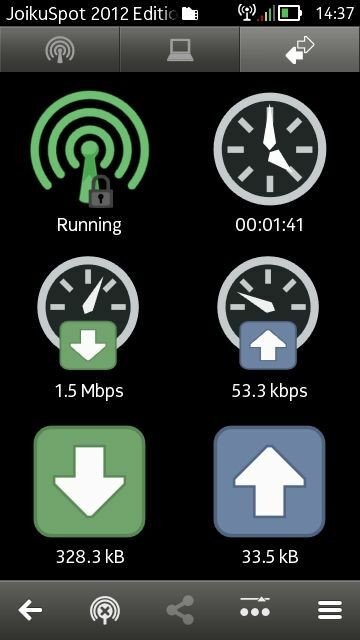 OBDScope is a vehicle On-Board diagnostics (OBD) software for Nokia smartphones. It works wirelessly with a Bluetooth OBD-II interface which is connected to a vehicle. The software uses the OBD-II interface to access the data available on the ECU of the vehicle. With OBDScope the data can be monitored in real-time and it can be logged to a file for further analysis. Key features include fault diagnostics, real time gauges and data logging. This program for manipulations with TAR archives has a rich menu of settings. It can both pack and unpack archives. When packing, it is also possible to create a compressed archive as well as to pack any files and folders. Opera Mini saves data and lets you browse up to 90% faster, even on poor connections. 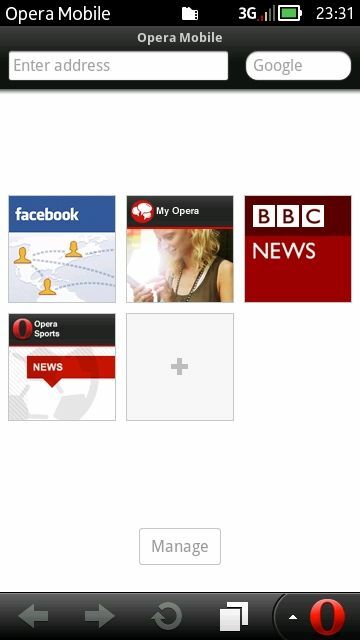 Opera Mini looks great and gives you quick access to all of your favourite sites. Keep up with the latest news, sports, and entertainment on the Smart Page. 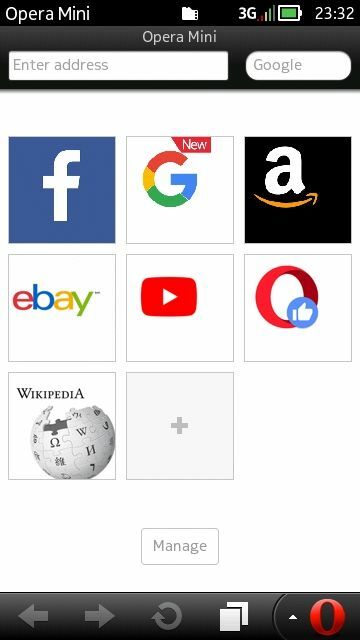 Synchronise your bookmarks and Speed Dial entries with Opera Link. 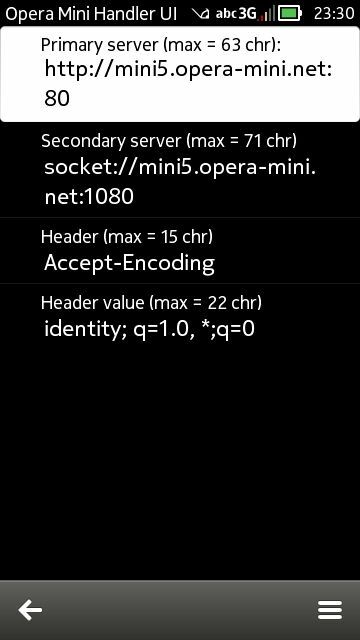 Opera Mini gives you faster web for free. Panorama Assistant helps you to create great high-resolution photo panoramas by using sensors to perfectly align each shot. 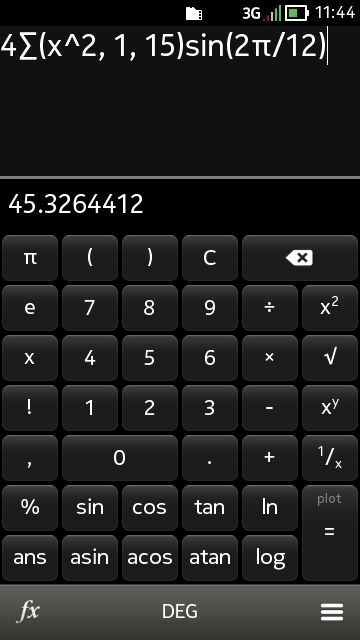 It is also possible to calculate panorama rotations or use the app as an attachment for external (e.g. DSLR) cameras. Note: Panorama Assistant does not stitch panoramas but it assists in shooting perfect source images for panoramas which can then be fused into high resolution panoramas using your favourite software! • Calculate horizontal / vertical rotations based on lens focal length, sensor size, overlap, FoV. • Supports all panorama types including 360° spherical. • Ideal for compact and DSLR cameras. 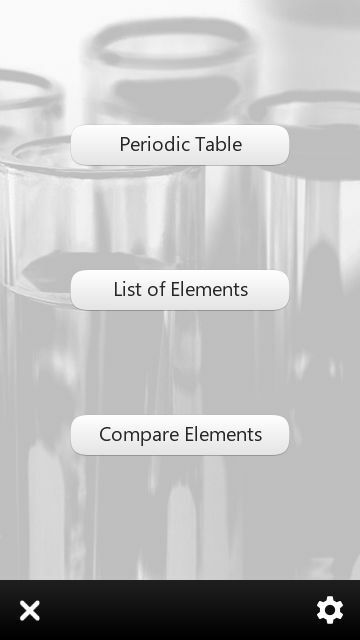 Periodic Table lists the properties of the chemical elements. 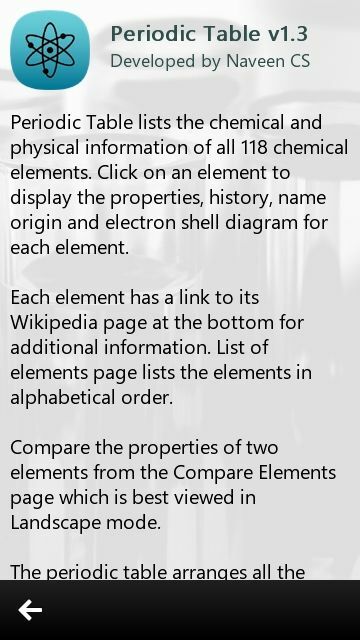 Click on an element to display the properties, name origin and electron shell diagram. 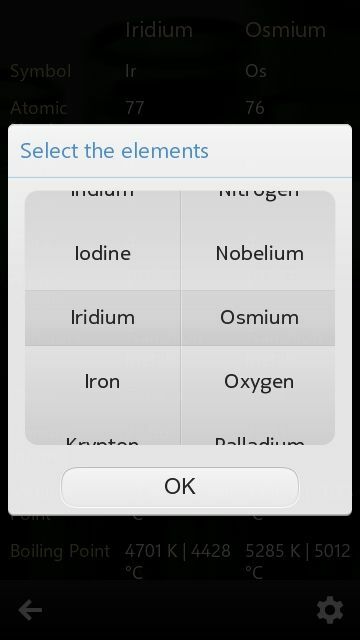 Properties displayed include: atomic weight, density, melting point, boiling point, specific heat, electron configuration, electrons per shell. Phone Commander (a.k.a. 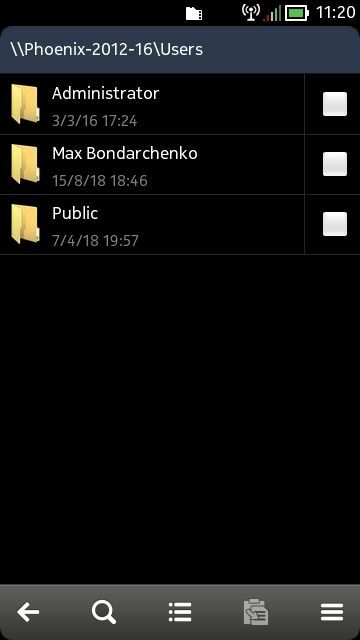 Twin Files) is a file manager application with dual-panel display for convenient transfers between two independent file listings. Supported functions include file copy, move, delete, rename, send, ZIP listing, detailed file, folder and drive information, attribute editing, and more. Besides full touch screen operation, keyboard shortcuts are provided for most commands. Turn your phone into a fully featured LED flashlight which can be controlled with the camera key. Both, the flash's LEDs and the screen's backlight are used as light sources. Other features are: an autostart function, different screen colours and brightness, and Morse codes (e.g. for SOS signals in emergency situations). Limitations: the N8 has a Xenon flash which must not run for long time. Thus the AF (very bright, but unstable) and Video LED (low intensity) are used which both emit RED light. Lens Corrector corrects / removes radial lens or barrel distortions which occur with wide angle lenses, such as used in GoPro Hero cameras, and fish eye lenses. Lens distortions are especially visible on aerial photography where straight lines, such as the horizon, show significant curvature. Photo Pixelizer allows you to easily share pictures with sensitive details, such as faces, unwanted advertising, etc., by covering these details. Sensitive areas can be covered with solid colour or a professional looking pixelized effect (full resolution supported). The "anonymized" pictures can be just saved to the gallery. • Support for arbitrary text stamps (watermarks), including file name, date, and time presets. • Change colour, size, and position (location). • Batch process multiple images at once. 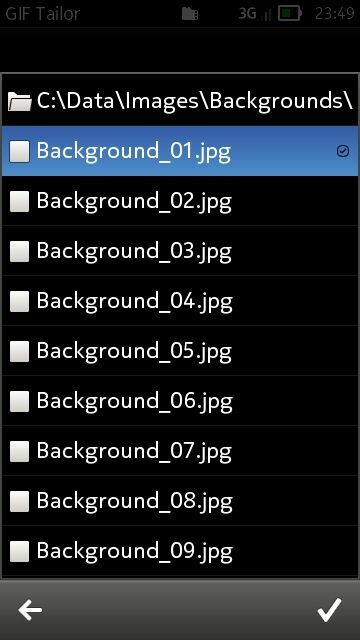 • Crop and resize images (batch). • Keep or overwrite existing files. PhotoBook is a compact photo viewer. 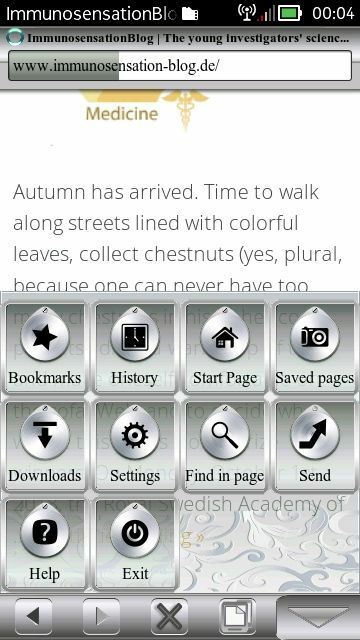 Easy create photo gallery and photo albums in your mobile. Apply more than 40 cool and professional effects to your photographs (full resolution only limited by free device RAM) such as old film, tilt-shift, one-picture HDR, rotation, distortions, colour mixing (RGB, HSL). PureFix (also known as PhotProc) is a photo editing application, written in Qt. It's especially designed for the 808 PureView smartphone; however, it works with other Nokia smartphones too. It lets you edit photographs up to very high resolutions. The editing tools are primarily aimed at amateur photographers, such as filtering for different light levels, colours, etc. Though you can't do things like paint on top of photographs or combine 2 photographs together. This application is slow in processing, but it's very stable. Create, edit, and share Microsoft Word documents (DOC & DOCX), Excel spreadsheets (XLS & XLSX) and PowerPoint presentations (edit PPT, view PPTX) on your Nokia device. Just install it and skip registration (as the service is down, registration is useless). Please note: the app installs only on drive C.
RAMblow is a memory and app manager utility that keeps your phone at top performance. Do you encounter Memory Full error messages? Having difficulty when starting up large applications? Does your phone slow down? Do you need to reboot your phone daily? RAMblow helps solving all these problems by its unique, automated and manual memory cleanup functions. A truly essential add-on for your Nokia phone! 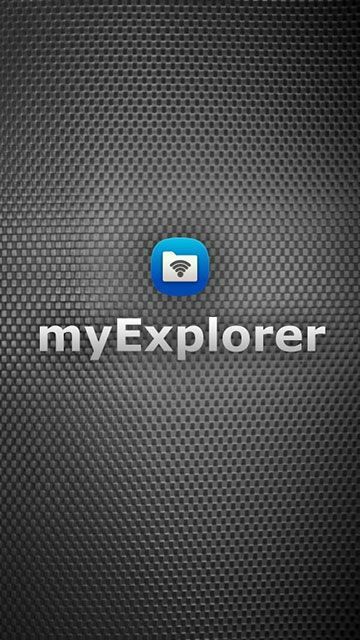 Ultimate quick and easy file sharing with all devices, over local Wi-Fi / WLAN network and over Internet. 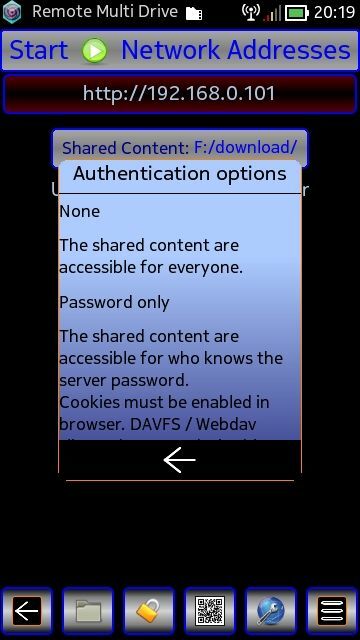 The shared content is accessible via web browsers and file managers which supports DAVFS / Webdav. 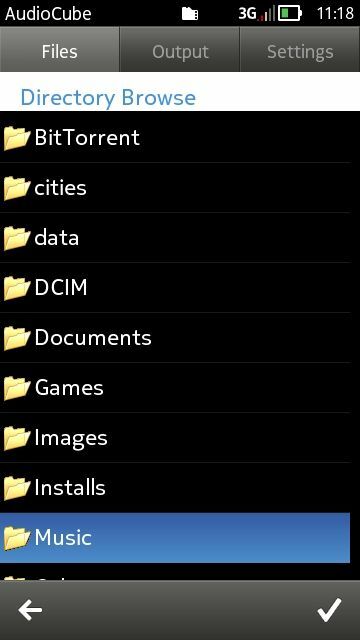 And there's a built-in File Manager with thumbnail view, bookmarks for folders, and wireless file synchronisation between PC and mobile. The File Manager can run in java supported browsers as applet and can run in new window with Java Web Start. No more fiddling around with the hardware key - now you can easily reboot your Nokia mobile phone with a touch button. Create a cool ice effect making your phone's screen look like a frozen window. You can remove the ice with your fingers and export the generated image (e.g. for email). • Supports PNG, JPEG, BMP, GIF, and MBM formats. • Hot keys support. Though it is impossible to assign any desirable key, the entire list has all the necessary keys and their combinations that will make taking screenshots quite convenient on any device. 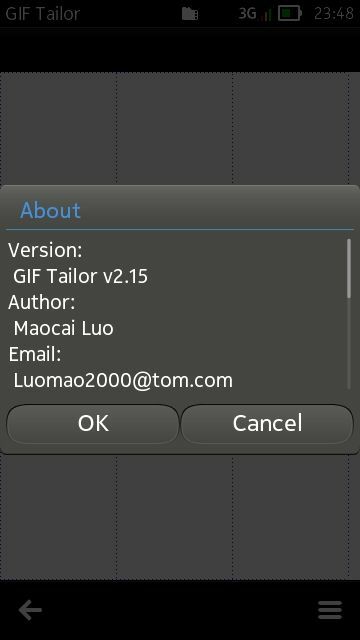 • Ability to record in real-time the screen to GIF file (the parameters are fixed and cannot be changed). • Select save location and file name. Apply effects such as old film, vignetting, mirror, colour separation, blur, fake tilt-shift, night vision, and many more to the camera live preview, capture shots (limited to approximately 1000x500 pixels due to hardware restrictions). ShaderFX can be extended with your own OpenGL ES 2 shaders with multi-texturing, time and mouse input. Silent Film Director lets you create silent and vintage films. It also provides basic video editing options, like choosing post-processing filter (20's movie, 60's and 70's home video, Black and White, Sepia and Vintage Sepia), customise video quality, pick soundtrack and customise video speed. You can record video from inside the app or pick already saved video file. After creating a video, you can share it via Email, as well as to save the resulting video to camera roll. Fix allows using F memory. • Add / modify files in the package without complete extraction. • Remove one or all files from the package. 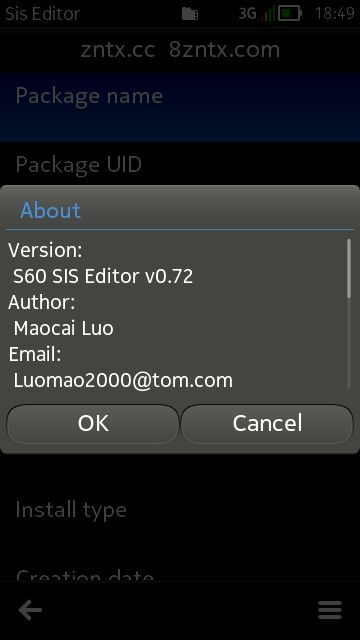 • Change package name, UID, version number, author's name, type of installation, date and time of creation, supported devices. 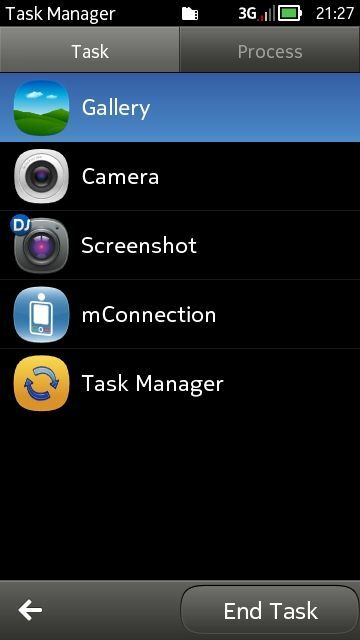 Initial modification by BodyZ, extending support for Symbian Anna and Nokia Belle devices. SmartGET is an easy-to-use and powerful download manager designed to fix all the problems you might have when downloading content from the Internet on your phone, thus being a must-have utility for those who want to avoid limitations of the default web browser. SmartGET supports simultaneous downloading of up to 5 multiple files. Furthermore, this download manager allows you to resume failed downloads (due to network errors) and contains a few really handy features like scheduled downloads or progress bars. It definitely improves download experience by offering clipboard links interception and giving you quick access to the most useful features over many customisable hotkeys. Loving that song? 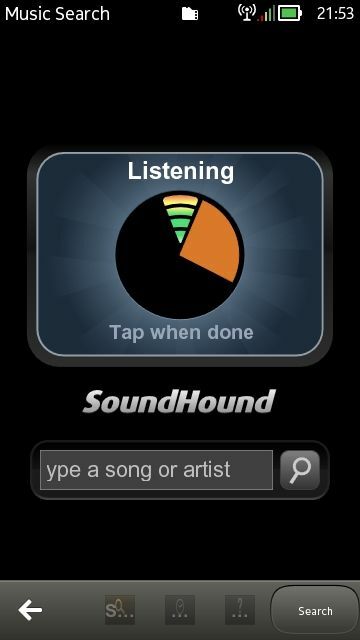 SoundHound is the fastest way to find and explore music. 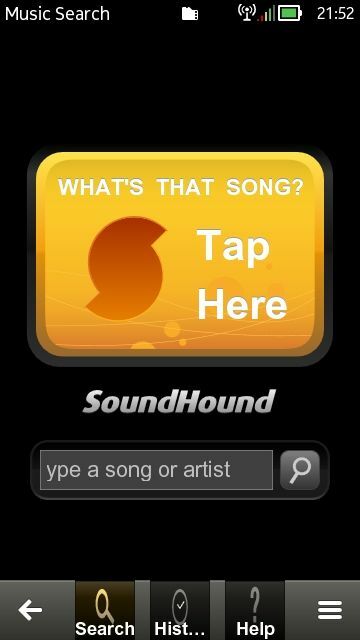 Just tap the orange button and sing, hum or hold your phone up to a speaker - and SoundHound names the tune! Already know the title or band name? Just use SoundHound's text search. Either way, SoundHound's music browser offers previews, videos and more. Split'n'Jointer is an application which has very fascinating functional: it is able to split and joint any, and I mean any, binary file! Why can this come handy? Well, for example, transmission problems exist, but you can split a large file into several transportable parts of smaller size to be sent via Bluetooth or the Internet. 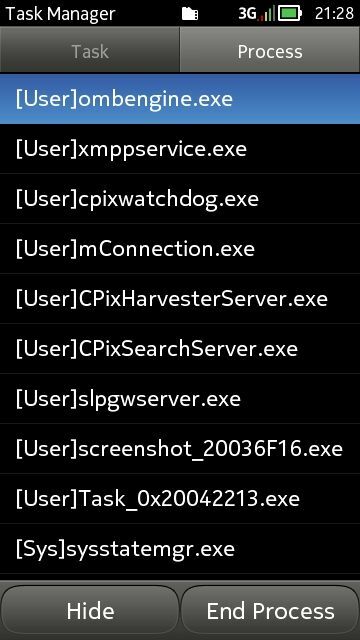 A user who receives such parts will be able to joint these fragments back into one working file seamlessly. Thus, the resultant file will be one-to-one, up to every single byte, identical to the original file! Convenient, right? In principle, you can joint anything to anything, but the result is likely to be non-working and you cannot get your files back from that. Based on the author's description, the program can work with fragments from 1 KB to 2 GB. 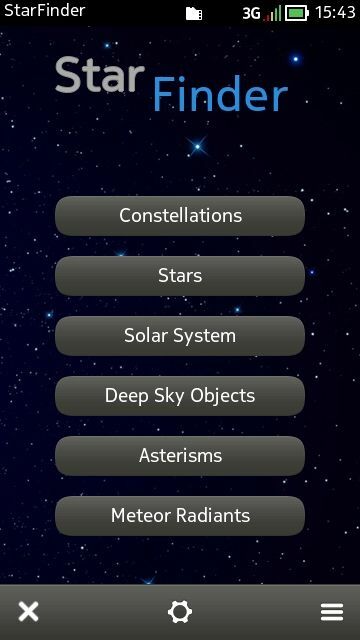 Easily locate stars, planets, constellations, galaxies, nebulae, clusters, asterisms, meteor shower radiants. 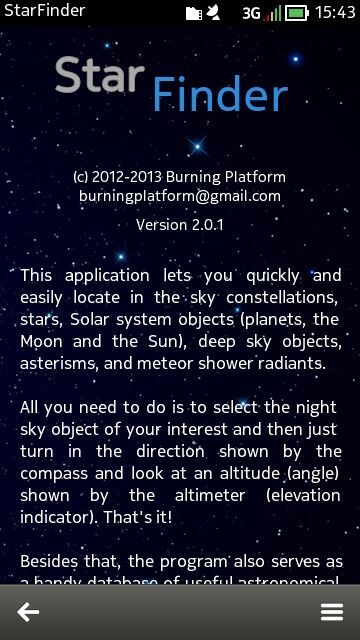 Just select an object and this app instantly shows you where it is in the sky. Turn in the direction and point the phone at the altitude shown so that both arrows turn green and there you have it! You've heard about Sirius or Vega, Pleiades or Andromeda Galaxy but were never able to find them? Can't locate Mars? Not anymore. 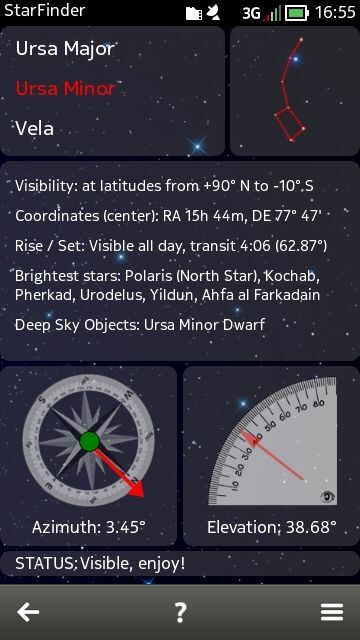 Also shows lots of useful astronomic data for each object. All you need to know about the sun and daylight. 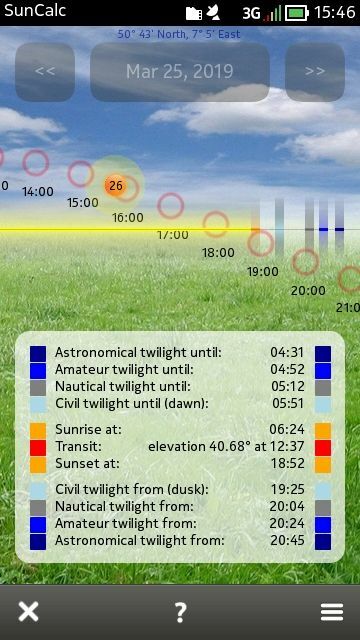 Track sun position for any location / date, get exact times of sunrise, sunset, dawn, dusk, twilight levels, day / night length. Calculate shadow length and angle. See day / night length graphs for the entire year. Use sun and shadow angle compass. Monitor when the sun gets above and below selected altitude. 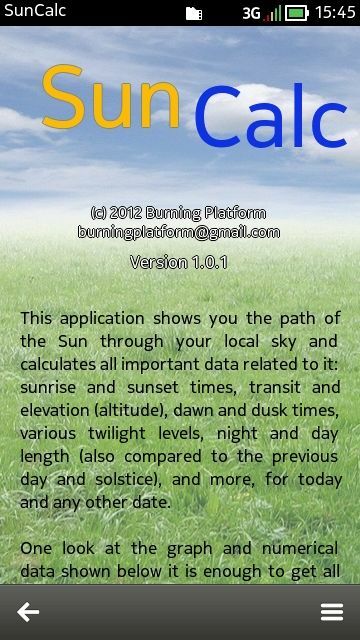 Get real-time astronomical data of the sun. System graphics are stored in MIF files. You can open, view, extract and replace them on your phone via the free app MIFEditor; but some are not SVG files, they are SVGB ones. Most editors and webpages don't accept SVGB and you can't edit it with a text editor (like X-plore). 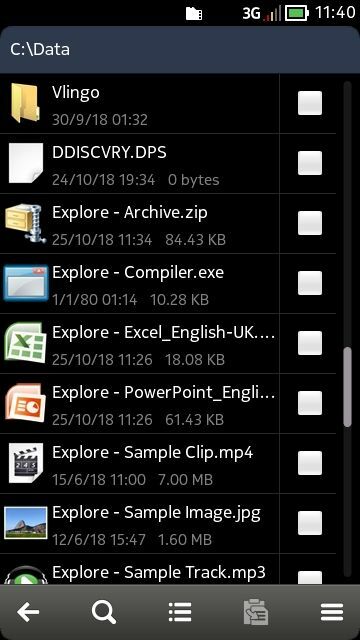 On a PC you can convert them via free tools, but this tool provides a way to do this directly on your phone: you can convert single files or folders. Note that renamed NVG or animated SVGB files are not supported, it's not possible to convert them at this moment. Another goodie is SVG to custom size PNG / JPG / BMP support: can be usefull to upload graphics or send them via social networks. The award-winning Swiss Manager is an essential software toolbox for the advanced user. Swiss Manager contains three applications built into one compact package: app manager, system information, and file manager. Features include: floating status icon with time and memory display, management of running programs, memory optimisation, file manipulation, detailed info on phone features, and much more. SymFTP turns your smart phone into a portable FTP server, allowing you to send files to and from your phone with any FTP client over a Wi-Fi connection. Use your computer's built-in browser to access your device by typing the address and port number into the browser, e.g. ftp://10.0.0.2:2121 or use a FTP client such as FileZilla (https://filezilla-project.org/). SymTorrent is a BitTorrent client for Nokia. It supports downloading multiple torrents at the same time and can save the status of your unfinished torrents, so you can resume the downloads after restarting the application. If a torrent contains multiple files, you can select which files you want to download. SymTorrent does not come with a torrent search engine. You can load saved torrent files from the flash storage or use your browser to get them from the Internet. First - task management, task list view, end task, switch task. Second - process management, process list view, end process, view the process details and so on. Time Chime is an advanced clock application that plays audible signals at specified times. It emits sound notifications at regular, customisable intervals. You can select from predefined sounds (like beep effects and bird songs), or use your own sound files. You can also make the phone vibrate, or even instruct the program to spell the current time via speech synthesiser. Toad Ftp is an FTP client that allows you to upload and download files over Wi-Fi. It also provides make directory, remove and rename actions. Version No: though this installation will state a different version No, the developer refers to this app as v.2.00. Create movies and impress your friends with your cinematography skills! VideoPro lets you make movies from stills and videos. Add them to your project, apply effects such as Ken Burns and Glamour, insert amazing transitions and top it off with stunning built-in special effect filters. 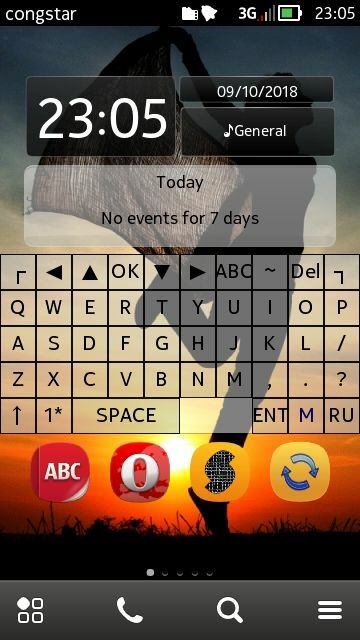 Virtual Keyboard adds an on-screen keyboard on S60v5 and Symbian^3 touch screen devices, making it possible to use native S60v3 software requiring the use of the hardware keyboard. With Virtual Keyboard your touch screen Nokia phone becomes compatible with lots of S60v3 applications that normally couldn't be used without physical buttons. 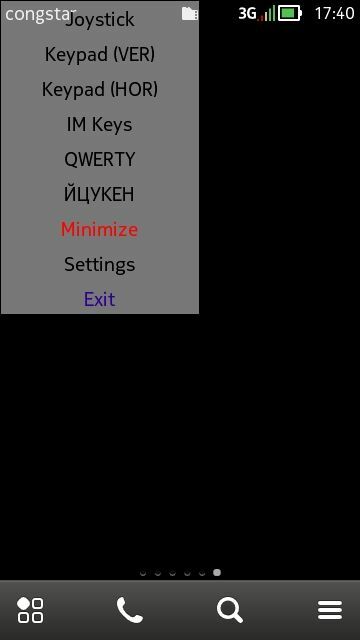 This program, modded by Egor, can display 5 different types of keyboard: Joystick; 21-button vertical; 20-button horizontal; IM Keys; and QWERTY. Watermark your images with text, timestamps, pictures, QR codes, and signatures. Watermark ships with different stamps including signatures of Einstein, Da Vinci, top secret, and other fun stamps. Fonts, colour, and opacity can be modified. Scale, rotate, and move watermarks easily with touch gestures and save the final image (full resolution supported) directly to the photo gallery. Writer Touch is a full-featured text editor with undo, redo, text formatting (alignment, colour, background colour, size, etc. ), image import, and zooming. 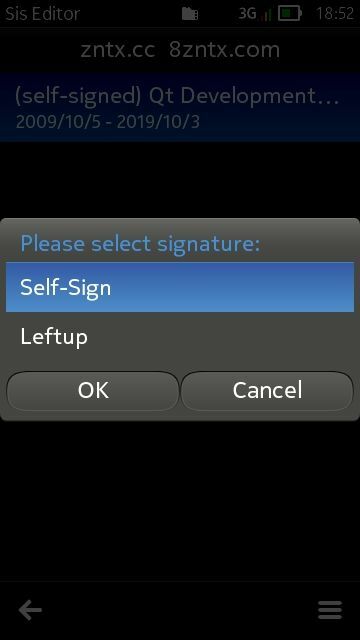 It supports keyboard and handwriting input. Text, mathematical formulas, scores, etc. can be directly written by hand. The final document can be exported as an image and, e.g., sent by email. While X-plore Belle Icons Mod by Simograndi already comes within Delight CFW, this page provides you sources from Lonely Cat Games. Y-Tasks is a great collection of system utilities that includes a task manager, file association editor, crash monitor, a font viewer, process and applications tasks viewing and killing, memory status monitoring and memory compression, as well as CPU usage monitoring. Zntxhan is an excellent editor for PYC, PY, PYD, DLL, LDD, APP, CLASS, EXE, and RSC file formats, used by modders. 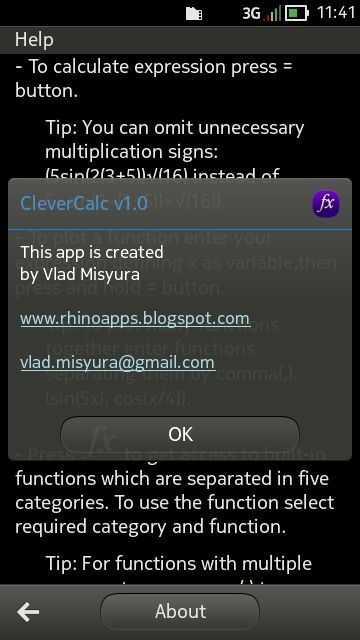 It has a LIST (syntax readable) and HEX (code) editor of files right on your phones. Its LIST editor is an easy and useful tool in editing text strings of Python's PYC or Java's CLASS files. The readable lists are generated in lines, and editing of suspected text strings can be done right away without much error in re-compiling the file (after saving). 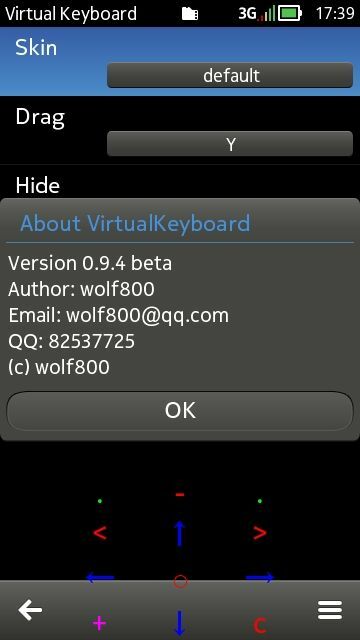 Note: to make this software work on touch screen devices, use Virtual Keyboard. Also modded by Wind. Information: this is so-to-say a web interface, which reflects ca. 1/100 of SIStore database. 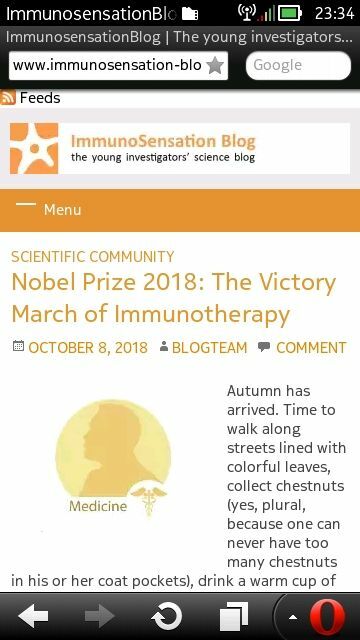 The purpose of it is to save this premium and elite content permanently on alternate cloud for "fair use" and to attract more audience to use SIStore! The majority of the software provided was discontinued long time ago, and thus considered to be "dead". Though, several programs are still being sold, please follow the links to buy them from the original developers!